The premier saltwater fishing spot on Florida's east coast, this park is a favorite for anglers nationwide for catching snook, redfish, bluefish, and Spanish mackerel from its jetties. Surfing is also a popular recreation and several major competitions are held here every year. Two museums provide a history of the area. The McLarty Treasure Museum features the history of the 1715 Spanish treasure fleet; the Sebastian Fishing Museum tells the history of the area's fishing industry. 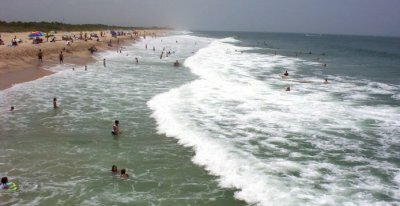 Three miles of beautiful beaches provide opportunities for swimming, scuba diving, snorkeling, shelling, and sunbathing. Canoeing and kayaking in the Indian River Lagoon are also favorite pastimes. Visitors can relax with a stroll down the mile-long Hammock Trail. A ranger-led tour cruises by Pelican Island, the first national wildlife refuge in the United States. Waterfront pavilions and picnic areas are great for family outings. Full-facility campsites and a boat ramp are available. Located on State Road A1A 15 miles south of Melbourne Beach.